As we&apos;ve learned thus far through the Year 25 series, a single year can really influence how the rest of your life shakes out. And that is really evident within the walls of a large room in the Chicago Cultural Center, where every week, a group of ladies gather for a senior citizens memoir writing class. Each week, they&apos;re given a new assignment by their editor and teacher Beth Finke, a local writer you may have heard on WBEZ before. She&apos;s been teaching the class for almost 10 years now, so she&apos;s always on the lookout for new assignment ideas. When she heard about our Year 25 series, she thought it might be fun to ask her students where they were at 25. Well, of course, I had to be there. The class of about dozen older ladies meets in a wing of the Cultural Center named, pretty aptly, I think, Renaissance Court. The writers are in their mid-60s to early 90s: You can imagine the stories they have to tell. They all sit around a long table littered with lipstick-stained coffee cups, a few pairs of reading glasses and small stacks of paper. Wanda Bridgeworth always sits in the same seat - at the head of the table, on the left side. You&apos;d think at 91 years old, it might be difficult to match memories with specific years of a long, full life. But as she begins to read her essay, it&apos;s clear that 25 really sticks out. "The VMAIL letter read VJ Day! Our unit alerted to head for home," she read. "I could hardly contain myself. I hugged my daughter and shouted, &apos;Daddy is coming home.&apos;"
It was October 1946. Wanda&apos;s husband was coming home from war, just in time for her 25th birthday. She says she remembers a big party at the house, with family and friends, celebrating both his arrival and her birthday. This would also be the first time Wanda&apos;s husband would meet their daughter, who was born after he left. All went well, Wanda writes, until bedtime. "When he started to get into bed, she jumped over the side of her crib and grabbed his pajama shirt screaming, &apos;You get out of this bed! This is my mama&apos;s bed! And you don&apos;t belong here!" Wanda read, while all her classmates burst out laughing. Wanda writes how that year brought lots of changes: she was diagnosed with hearing loss, lost her new home to the railroad and on and on. Another reminder of how unpredictable 25 can be, no matter what generation you&apos;re born into. For some of these writers, the adventures were of their own making. For Nancy Walker, all it took was one decision to kickstart a year of self-discovery. The year was 1963 -- she had been teaching in Mount Prospect for three years. "I loved teaching," Nancy read, "But I wasn&apos;t meeting any new people in my 2nd grade classroom. So I decided to resign from my job and look for a glamorous job downtown." So off she went, submitting applications for the few female-wanted ads in the newspaper. Turns out, her search ended up bringing her right back where she started -- she was hired later that year to teach at a school in Skokie. And she stayed there for the next 31 years. "The decision to resign from a good job when I was 25, could have been disastrous," she went on. "But now, I view it as one of the best decisions of my life." And that’s the thing about this class: 25 was so long ago, that the lens these ladies are looking through often lets them see quite clearly how that one year fits in the span of their whole lives. That&apos;s something I learned from Hanna Bratman, who was 25 almost seven decades ago. It was that year that she gained her U.S. citizenship. "It meant that I now could say I&apos;m an American. I no longer had to identify myself as a German Jew," Hanna told me after class. Hanna says that new identity was very important to her. She calls herself a "Holocaust person" and told me some of the stories from her young life in Germany. She was thrown out of school when Hitler came to power, she recalls. And then there was the time she broke her leg and had to drive for hours in the middle of the night to find a doctor who would treat her. "I think you grow up pretty fast when you&apos;re really on your own," she says. But yet, she says, she&apos;s always been a positive person. And today, at 93 years old, she&apos;s still keeping busy. She leads a support group for people with vision loss, she leads a midlife group, and as she puts it, "I help all the way around." And she also shows up for this class, every week, to listen to her peers tell their own stories. But there&apos;s another story here that was not shared in the class. A 25th year that has rippled out from one person to all of these students. For Beth Finke, the woman who is teaching them, 25 started out with a lot of excitement. Her now-husband, Mike, proposed to her on her birthday. 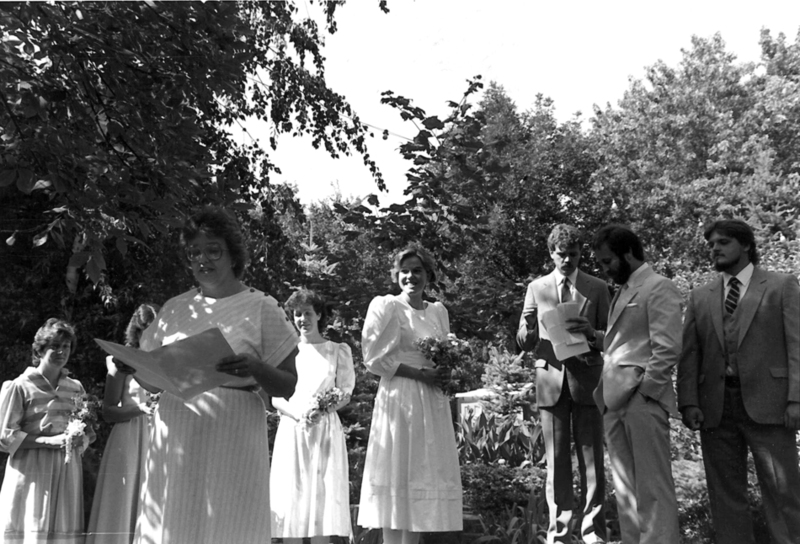 "We looked forward to having all our friends come in town...we got married in my sister’s back yard. [We] all went to a White Sox game the day after, just, fun, fun, fun," Beth recounted. But things took a sudden turn on her honeymoon in Scotland. She recalls that she started seeing strange spots. "I took my contacts out and cleaned them and put them back in," Finke said. "And I knew right away." Beth had been diagnosed with diabetes when she was seven, so she knew issues with her eyes were a possibility, but she didn’t think she’d lose her sight altogether. For the next few months, her 25th year would be spent going back and forth between downstate Champaign and Chicago for surgeries and doctors’ visits. "We tried really hard to save my eyesight," she said. "But by July of my 26th year I was totally blind." So the things Beth saw during her 25th year - her wedding, her family members’ faces, the White Sox stadium - those are the images she still has in her head today. Of course, the following years were transitional ones; she had to learn how to read Braille, how to use a cane, but with all of these changes came a gift: writing. She says there was something therapeutic about putting all her feelings and life changes on paper. It’s a gift she’s now able to pass on to her students. "I give them 500 words. That’s all they have to write these essays, so if you only have 500 words to work with you have to use really strong words. You have to really think about what you’re writing," Finke said. And as many of her students near the end of their years, it’s these strong words that give them a chance to honor the lives that they’ve lived.